Philadelphians know a thing or two about pretzels. With that pedigree, I'm qualified to pronounce Gratify's gluten-free sea salt pretzel thins a satisfying snack and a deserving dip companion. I sampled Gratify's GFCO-certified pretzel sticks and yogurt-covered twists at a natural foods show last year before they hit the market, but didn't have the opportunity to try its other snacks until recently. I found the thins at Walmart earlier this summer (at $3.99 a bag) but waited until my son came home from camp before trying these. Turns out the entire family has taken to these - they're crisp and light. A bit buttery, I'd liken them taste-wise more to Glutino's pretzels than Snyder's. They're also closer to Glutino as to total fat and calories (more than Snyder's). For that matter, the Gratify label, owned by Israeli food distributor Osem, seems to be emulating Glutino. Both have pretzel sticks, twists, salt and sesame thins, and chocolate and vanilla-yogurt covered twists. 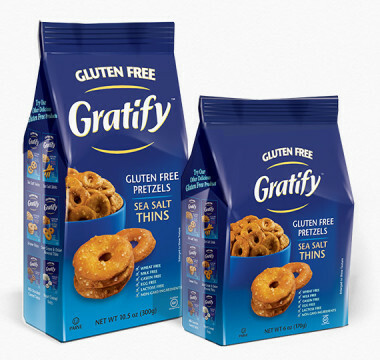 Gratify's pretzels are made with non-GMO ingredients and are also free of milk, casein, egg and lactose. Gratify will soon be expanding its product line to cookies and crackers. In the meantime, look for the pretzels in stores and online at Amazon.com. You can also like Gratify's Facebook page for a $1-off coupon. We just tried the pretzel thins out at the office, too. We're big fans!